I was thinking of bloggers and how nice they are collectively. Of course, if I could get each and every person a little token of happy for the holiday, I would, but I like far too many bloggers to do that, I would absolutely go broke. ;) Still, it was a thought and many of you have one or two bloggers you are especially close to, so perhaps this idea would be great for you/them! A lot of you know Janine from Confessions of a Mommyholic. 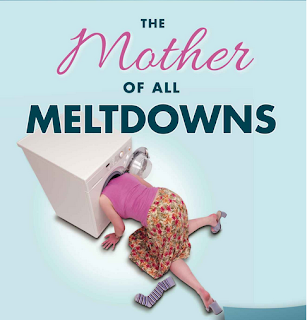 Oh my gosh, she's just nice, funny, sincere, AND she's got a piece published in the book, The Mother of All Meltdowns. The book is a compilation of stories by 30 different writers, all sharing a personal story with you. The book is sure to evoke emotions. It may make you laugh, cry, or find yourself nodding your head in agreement because you can relate. My favorite part is that each of the writers is also a blogger. That got me to thinking this would be such a fun gift to give another blogger, if you did have one (or more) on your list that you wanted to give a thank-you to, or simply say Merry Christmas. Big kudos to the gals who wrote it, and took the time to have it published. Wishing you all every good success with your writing endeavors! Information and purchase information on the book can be found here. Will have to check this out, my sister in law also just recommended the book! I've seen a lot of recommendations going around for it too. :) Thanks for visiting! I'm happy we're friends too. Merry Christmas to you and your lovely fam.!! Wishing you well with the book. Rosey, I could not agree with you more about bloggers! And you are one of the nicest! I'm glad you liked the book and Janine's piece. Merry Christmas to you and your beautiful family. Pot calling the kettle black, you are one of the best of the best of the best too! Merry Christmas, Rachel! Great idea, Rosey! Thanks for your support of the book. Happy Holidays! I love Janine and this book sounds hilarious. My boys are each getting Kindles for Christmas, so once they do, I will be downloading it. Rosey, thank you so much for sharing our book! We so appreciate it! I have given it to a few of my mom friends, because who among us hasn't had one of those moments! Thanks for your visit, Michelle! My husband asked me this weekend if I needed a time-out? I said, "Yes please!" During the time he asked me Mica and Isaak refused to get in line for breakfast (breakfast at the Y with Santa). Isaak sat down, and spill his juice right away. I was frustrated beyond what I should have been. Sounds like a good read indeed. Thanks for promoting the book, Rosey! Good friend, you are, to promote her book. I was so happy to hear your pipes are all better and everything is dried out. Just in time for Christmas, hurrah! It sounds like a good book! And I love the title and cover photo. SO funny! Wishing you a Merry Christmas! Thanks, Tammy. Same to you! I love mom books I can relate to, they're so much fun to read! great gift idea - thanks and Merry Christmas! That's a great idea, and I'm sure the writers really appreciate the mention :) I want to wish you and your family a very merry Christmas Rosey! I just may get this for a blogger I know! Here's wishing everyone a very Merry Christmas and a happy healthy and peaceful New Year! Thank you and the same wishes to you! That sounds like a great book I am definitely going to have to check it out. I buy a christmas gift for my special blogger friend each year. Maybe I can get her this as an extra gift. Thanks so much for posting this. I am sure that book would be hilarious. I bet your friend is proud to be published in it! I might have to check it out after the holidays when things slow down a bit. Thanks for reading. Happy holidays to you! A big Merry Christmas to you and your daughter too! I heard about this book yesterday and am looking forward to checking it out. My kids were always great about having meltdowns! Now those are going to be good stories to read! Looks interesting, not that I'm gonna judge this book by its cover, thanks for this review. I think it's so great when we can support each other in all of our endeavors as bloggers. Sounds like a great read. Oh Rosey, you are so fun. Thanks for your Christmas greeting today. I am sure this book is very interesting. I love the cover! A great choice for the title. Have a Very Merry Christmas Rosey! I like the compilations too, because you can read one and put it down when you need to, without losing your train of thought in the story. Stopping by to wish you and your family a Very Merry Christmas and a Happy New Year. I know a few young mothers who may be very interested in this book. This looks like a great book! Good luck with it! I wish them much success too! Thank you for your visit. Thank you for this information. It looks like a fun read. Happy Holidays to you and your family! Thank you Pam, the same well wishes to you and your family! If I had a kindle i'd give this a shot. Looks like really good reading. You are right, bloggers do seem to be an overly nice bunch. I think so too, Michelle. Thanks for your visit! I totally agree with you about bloggers! And you are the bestest! Good for Janine! You're right, Rosey, she is such a nice person. Cool book too! I have to check out and share this book with the club. I love that it's a group of bloggers writing!